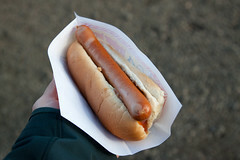 As I mentioned before in my review for Bæjarins Beztu Pylsur… Iceland loves its hot dogs. Virtually every staffed gas station will make you a hot dog. The major towns all have several hot dog carts. And even minor tourist attractions 30km from the nearest paved road will often have hot dog carts. Well, on the fourth day of our driving trip, as we explored the Myvatn area, one place we checked out was the Krafla area, a series of geologically active ridges that include Leirhnjúkur (erupted in the early 1700s in what are known as the "Myvatn Fires") and Krafla (erupted last in 1984, now the site of a 60 MWe geothermal power station). 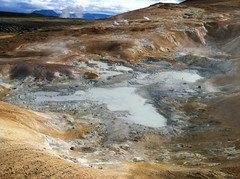 Leirhnjúkur itself is a nice hike where you can see hot ground, steam vents, bubbling pools of mud, etc. It really is an incredible place to visit, with all sorts of neat sights, sounds, and smells, almost like visiting a prehistoric version of Earth. It’s also a place where you can get a hot dog. Sitting right at the edge of the old lava fields from the old Myvatn Fires, there’s an enterprising hot dog stand owner who set up right in the Leirhnjúkur parking lot next to the trailhead. So in addition to the various mud pots, fumaroles, fissures, and vents, I was also able to conjure up a mid-afternoon snack of an Icelandic pylsur. How was it? I’ll have to still give my nod to Bæjarins Beztu Pylsur, but Pylsukoffin made up a decent hot dog. Still a good Icelandic lamb hot dog, served up with the full raft of condiments (fried onions, raw onions, ketchup, sweet mustard, and remoulade). and hot dogs, oh my! What a great place to snack on a hot dog! I’ve been curious and wanting to try those lamb hot dogs for a while.